Woman Skier Conquers Everest, 'Seven Summits' After her recent descent from the summit of Mt. Everest, Kit Deslauriers has become the first person to ski from the seven summits -- the tallest peaks on each continent. Deslauriers says she hopes her accomplishment will be an inspiration to other women. With her recent descent from the summit of Mt. 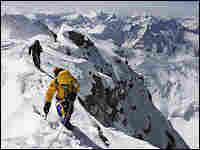 Everest, Kit Deslauriers became the first person to ski the "seven summits" -- the tallest peaks on each continent. Deslauriers skied down Mt. Everest on Oct. 18. The conditions deteriorated quickly while her expedition was on the summit, and she describes skiing down "5,000 vertical feet of 45-to-50 degree mostly shimmering blue and white ice." "My whole idea is to challenge our own perceptions of what we find our limitations to be, because those are really mostly mental," she says, recalling how her mother had always wanted to be a sports news broadcaster, a path that wasn't acceptable at the time. "I've always tried to do whatever my heart had in it, whether it was acceptable or perceived as possible or not," Deslauriers says.